Presented by MarketWatch.com, Big Charts is a service that no person who is into the Stock Market could turn a cold shoulder to. In a nutshell, Big Charts makes it painless to stay on top of all your stocks, even when you have little time to do so. This service can be accessed at BigChart.MarketWatch.com, and the site has already got everything any stock holder will need to keep up with his stock options. The key feature of the site has to be the IndexWatch feature. This allows you to see how any major player in the stock market is evolving over time. This is unarguably the site’s most valuable tool, and (not coincidentally) it is the first thing that you see when you visit it. And then, there’s two other great tools that you can also use at no cost: the Historical Quotes, and the Interactive Chart. The Historical Quotes are a great resource for anyone who wants to inquire about the past history of any company. There, you will be able to choose the company you want to know more about and see how its stocks have been performing ever since it started being a publicly traded company. On the other hand, the Interactive Chart is a more extensive version of the IndexWatch. It allows you to incorporate both the historical data found on the Historical Quotes with the up-to-date information found on the IndexWatch, and have an increased understanding of how any company is going to stand in relation to your investments in the near future. 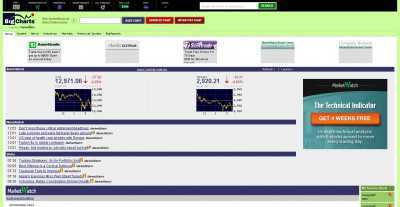 The site serves a key informative function for anyone who is looking to make the most out of their stock markets investments. The interface might draw off some stock market newbies, but on the whole the site does what it is meant to do: inform people on how their stocks are doing. Couldn’t the interface become easier to use for beginner-level users?